Voir dire: to see them say, or to tell the truth? The word voir in this context — i.e. paired with the word dire — isn’t in fact related to the modern French verb meaning “to see”, as so many people assume nowadays, but instead comes from Old French and derives from the Latin word verum, “that which is true’. In Latin, verum dicere means “to tell the truth.” If anything it’s related to the modern French word voire, meaning “indeed” — and hence the legal term is sometimes spelled voire dire. This confusion of voirs has led historically to what’s called a false etymology, whereby lawyers and jurors all over America think the process is about seeing and witnessing the jurors speaking, when it’s really all about them telling the truth. Voir dire is a legal phrase that refers to a variety of procedures connected with jury trials. It originally described an oath taken by jurors to tell the truth, and it was coined back in the 1670s. Fast forward three-and-a-half centuries, and while in the U.S. it’s still very much a jury-oriented term, referring most often to the process by which prospective jurors are questioned about their backgrounds and potential biases before being chosen to sit on a jury, in the UK (except Scotland) and some Commonwealth countries, it describes more generally a “trial within a trial”: a hearing to determine the admissibility of evidence, or the competency of a witness or juror. As the subject matter of the voir dire often relates to evidence, competence or other matters that may lead to bias on behalf of the jury, the jury is often removed from the court for the voir dire in these countries. Which might explain why jurors of British or other non-American nationalities might not have even heard the term, let alone know or understand where it comes from. This entry was posted in Etymology, Words, phrases & expressions and tagged voir dire meaning, voir dire origin, voir dire translation on May 5, 2017 by Louise. With reference to the last part of this helpful entry., In the United States, the practice of cross examining a witness during trial on his qualifications to render an expert opinion on a particular point or in a certain field, is still called a voir dire. The same is true for lengthier side track examination of fact witness’ competency or personal knowledge about a relevant issue in the case. “Your Honor, may I have a voir dire to help determine whether this witness from the Psychiatric Institute understands the nature of his oath, and is therefore competent to testify under state law. Thanks, Paul. Very interesting and helpful. 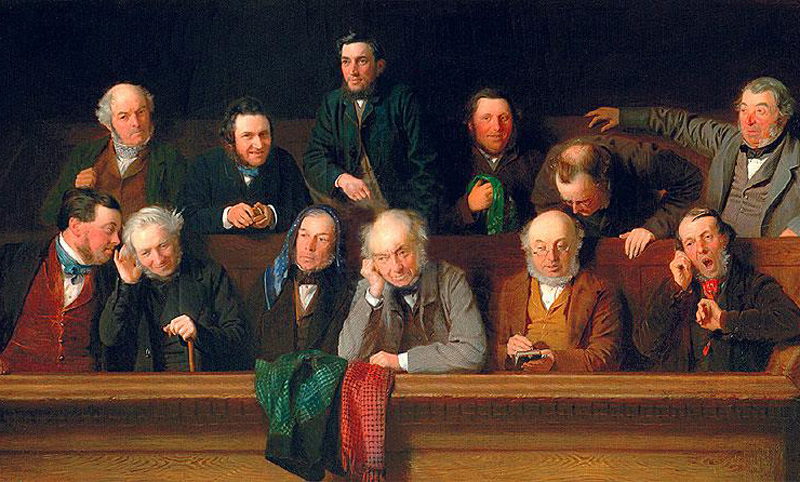 It is much more likely that the process of examining jurors for potential bias, now called voir dire, actually does come from the French verbs translated as “to see” and “to speak.” The words are also used to describe the process of examining a witness regarding what they know about a proposed exhibit. Attorneys wishing to question a witness about the foundation for an exhibit, are taught to ask the court: “may I voir dire [the witness] on the exhibit. To see and to speak – that is what happens when jurors are examined for bias, and when witnesses are questions about the foundation for an exhibit. When jurors are selected secretly, out of court, they are not subject to voir dire, but they are still sworn to render a verdict, i.e., to speak the truth. I wasn’t around when the Normans conquered England and imposed their legal system on top of the English system, so I can’t say for sure when the term voir dire came into use, and who introduced it. I can say it is highly unlikely that the Latin veredictum was translated into voir dire, since it was so obviously translated – in English – as verdict. Languages are twisted by lawyers and judges, to suit their purposes. The purpose of courts is to control and manipulate jurors, while presenting the appearance of a fair and public proceeding. Regardless of who is right on the “original” meaning of voir dire, the voir dire process has been corrupted to serving the objectives of the court, which, so often, is to select a compliant and obedient jury which will succumb to the control of the judge.